BlogHer’s second eBook is a love story about memory and food penned by 36 personalities from the culinary blogosphere. The warmth and candor of this anthology will transport our audience and reveal the depths of meaning that food possesses as the universal language we all share. BlogHer, Inc., the premium cross-platform media network and publisher for women, announced today the release of its second eBook anthology, Roots: Where Food Comes From and Where It Takes Us. 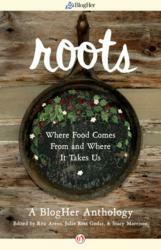 Roots will be launched with fanfare at BlogHer Food ’13, when five contributors will present their pieces from the main stage on Saturday evening, June 8, 2013 in Austin, Texas. As the live extension of BlogHer’s online food network, the third largest on the web, BlogHer Food ’13 hosts hundreds of food bloggers, cookbook authors, culinary experts, food activists and top food brands in the largest event focused on food and social media. Roots is an exploration of food’s rich interconnection with culture, memory and discovery, and includes writings from 36 different personalities and cookbook authors from the culinary blogosphere, selected from hundreds of submissions. The anthology's deeply personal essays serve up family history, local lore and tantalizing stories of worlds newly discovered through food, accompanied by original photography and a collection of recipes that, no matter how far flung, taste like home. Roots is divided into two sections: “Memory” illustrates the emotional beauty of food as it passes across generations and defines history; “Discovery” reveals the pathways down which food can take us, luring us into new cultures and experiences. Readers will be transported around the world, whether through tales of quirky local fare such as Wisconsin’s “kneecap” pastries or New Jersey’s curious pork roll, or more farflung, to an Italian love story or a wordless meal in Morocco, where the language of food connects complete strangers. The publication and distribution of this collection—the second, after the BlogHer ’12 Voices of the Year Anthology published last Fall—is yet another opportunity for BlogHer community members to be published, promoted, and paid for their work as active participants in the "BlogHer Economy," which has paid out $25 million to 5,000 bloggers over the past four years, from 2009 to 2012. Both the Voices of the Year Anthology and Roots are published in partnership with Open Road Integrated Media. BlogHer (http://www.blogher.com) is the leading cross-platform media network created by, for and with women in social media. BlogHer delivers quality advocacy at scale for brands seeking to engage in authentic and persuasive dialogue with moderated communities led by more than 7,000 leading influencers who reach an audience of 92 million across premium blogs, Pinterest™, Facebook®, Twitter™ and social media, including 55 million blog readers alone (Source: Nielsen Site Census, March, 2013). Founded in February 2005 by Elisa Camahort Page, Jory Des Jardins and Lisa Stone, BlogHer publishes and syndicates news, information, advice, recommendations and research on women in social media across interest areas as well as on BlogHer.com. The Company also hosts the world’s largest conferences for women in social media.